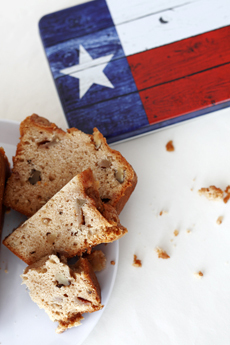 Send a gift of fruit bread (here, banana bread) in a keepsake box. Photography by Katharine Pollak | THE NIBBLE. CAPSULE REPORT: Did you know that banana bread, zucchini bread and all other cake-like breads are called “fruit breads?” America loves a good fruit bread; and St. Lucia Breads serves it up—along with blueberry bread, cranberry bread, pumpkin bread and more—in beautiful gift tins. For some 20 years, St. Lucia Bread Company, an artisan bakery in Dallas, has been turning out all-natural, fresh bread and related products for an appreciative audience. If you’re in the neighborhood, you can stop in for hand-kneaded rye, sourdough, wheat, white and multigrain loaves. You can also buy fruit breads—banana bread, blueberry bread and other loaves that cross the border into cake territory. They’re more dense than raisin bread and more moist than date nut bread. You can use them for sandwich bread—just don’t put cold cuts and mayo on banana bread—although cream cheese or nutted cream cheese works just fine on them. 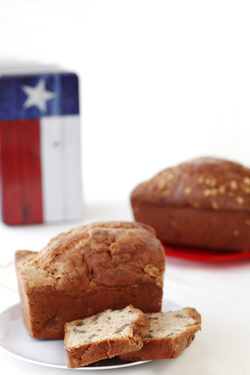 The fruit breads travel well and have a longer shelf life than a regular loaf. 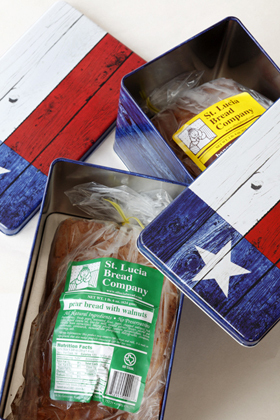 So, in handsome red, white and blue gift tins, St. Lucia has been shipping a “Little Taste of Texas” to anyone, anywhere, who’s in need of a moist slice of breakfast bread. The spiced breads use fresh fruit instead of processed, whenever possible (yes to fresh banana, but dried cranberries work better in baked goods). There are no artificial ingredients, flavorings or preservatives. Loaves can be kept in the freezer; slice and enjoy at will. For lucky gift recipients, there’s a bread-of-the-month club, with a different fruit bread arriving at one’s doorstep. The first loaf is packed in the gift tin, with refill loaves sent for as many months as you like. For someone special—or as a corporate gift—this gift will generate many thank-you’s. By the way, while they say it’s better to give than receive, there’s no law saying you can’t put yourself on the list, too. Just say “Yes” and sign up today! *Prices and product availability are verified at publication but are subject to change. Shipping is additional. These items are offered by a third party and THE NIBBLE has no relationship with them.